Through my association with professional athletes, I have represented various celebrities in the television, motion picture, and music industries. I have often been a legal commentator and analyst for local and national networks such as Fox News, Court TV, CNN, MSNBC, and more. Because of my expertise in the area of professional sports and the law, and by working for the Oakland Raiders, as well as having represented many former and current professional athletes in criminal and civil cases, while lecturing to NFL Players as part of the NFL Life Skills program and lecturing to college student athletes about conduct on and off the field I am called on regularly to make nationally televised appearances in high profile sports cases such as the cases of Tiger Woods, Michael Vick, OJ Simpson, Isiah Thomas, Barry Bonds, Marion Jones, and Roger Clemens as well as the highly publicized Mitchell Report. Click HERE to view televised appearances I’ve made in these cases. I’ve also supplied my unique insight and commentary on many high profile cases involving entertainers and others in the national main stream news, such as singer Michael Jackson, the Scott Peterson murder case, the Natalie Halloway murder case, the Robert Blake murder case, Martha Stewart stock fraud case, and many others. I was also a legal analyst and co-hosted a talk show on KPIX radio during the OJ Simpson murder case in 1995. Based on my extensive experience with the media while working and commenting on various high profile cases, I have learned through experience how to effectively utilize the media to help my clients within the context of the law. In some cases I utilize the media to help my clients, and in other cases I use my experience with the media to remove the case from public scrutiny. 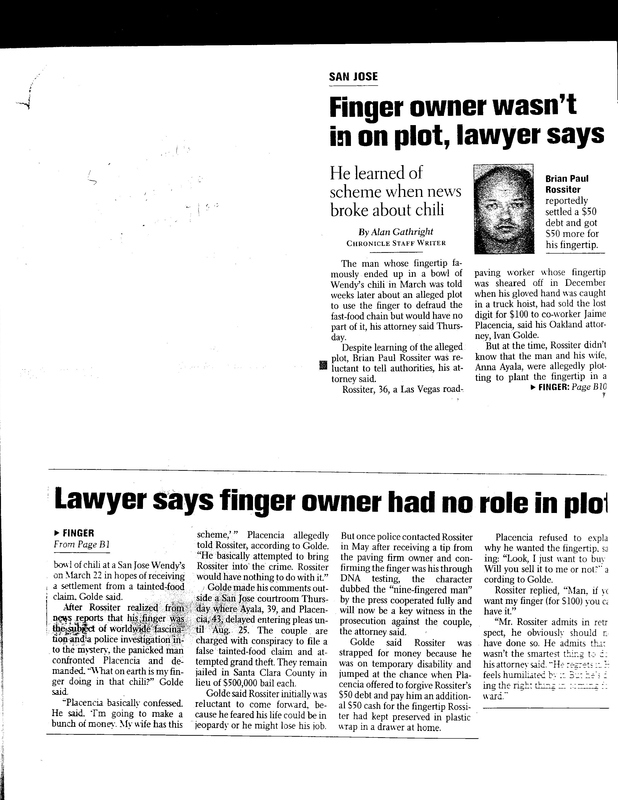 Several of my clients have been featured in the national media, such as Susan Polk, who was accused of killing her therapist husband, and Brian Rossiter, the man whose finger was used by those convicted in the Wendy’s finger chili case. It should be noted that my client, Brian Rossiter was neither charged nor convicted in that case, the Wendy’s finger chili case. The Wendy’s chili finger case is a good example of how I utilized the media to change public perception of a client in a positive way. This article from the San Jose Mercury News was published statewide: Man Who Sold Wendy’s Chili Finger a ‘Hero’. Click the link to read the article.